Located less than an hour west of downtown Toronto, in Wellington County, Guelph is a great place to explore this summer! Whether you live in the area or are looking to plan a day trip, a weekend or longer there are tons of things to keep you entertained. Guelph is a University town, has a wonderful downtown and is a growing community you need to see. Here’s a look at 10 Places in Guelph that you might enjoy! 1992 the Donkey Sanctuary has been rescuing donkeys and offering them a peaceful. Meet the nearly 90 donkeys that call this farm home on select afternoons throughout the summer and fall or go or a hike on their nature trails. Head to Elora Gorge for a hike, a float down the river on a tube or bring your tent and stay for the weekend. There’s even a splash pad! The Elora Quarry boasts a large beach surrounded by cliffs up to 12 meters high so grab a group of friends for a day in the sun this summer. Did you know Switzer-Carty Transportation now provides school bus and private bus trip services to Guelph and Wellington County! We’re proud to be a part of the community serving customers and employing hundreds of residents! Plan a camping weekend to take in all that Guelph Lake has to offer. You’ll find hiking trails and a nice beach to relax away from the city for a bit. They even have a nature center where you can pet snakes and plant trees! Canada’s largest outdoor antique market has been offering deal hunters, antique buffs and weekend shoppers a great place to shop since 1961. You’ll find over 100 vendors gathered every Sunday looking to sell their wares. You can even grab lunch from one of the food vendors on site! Catch a movie on the big screen from the comfort of your car this summer at the Mustang Drive in! A summer must-do for any age, you’ll find a snack bar with typical movie fare and more. Check their website for movie play times! 5 generations of Sleemans have grown this local brewery from it’s humble roots to what it is today. Visit on Thursdays and Fridays to take a tour and hear the history firsthand (and try out one of their delicious brews!). The African Lion Safari is a wonderful place to see exotic animals and get up close and personal with them! After your tour of the game reserves where you’ll see cheetahs, lions, giraffes and more, head over to the petting corner then cool off in the waterpark! Step back in time and explore the birthplace of John McCrae, soldier, doctor and author of ‘In Flanders Fields’. Spend some time learning about his life and viewing artifacts and pictures from his time spent in this house. This museum is part of the Guelph Museums network and was opened in 2002 to share the culture and natural history of Guelph. It showcases rotating exhibits and programs and offers visitors a look at the history of the area. This park, filled with limestone cliffs, glacial potholes and caves, is a natural oasis that needs to be explored! Rent a canoe and take a ride down the Eramosa River or explore the ruins of the Harris & Co Rockwood Woolen Mill. Whatever you get into, you’re sure to have a great day! Explore Guelph as Your Destination this Year! With so many great things to do around Guelph, you’ll never tire of exploring the area right outside your door! These options also offer a great reason to gather up your friends and family. 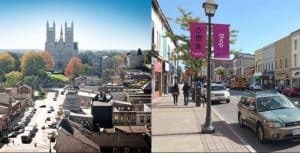 For those of you hoping to visit Guelph or area destinations, get your group together and plan your trip now!